Composition books are one of my favorite tools. My kids and I use them for so many of our daily tasks. I use one as a planner and I use them for my kids homeschooling as copy work and tracing books. 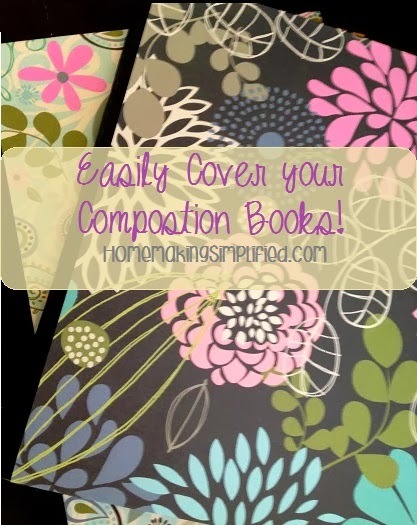 There are so many uses for composition books! The only thing that keeps me going back to buying commercial planners--that I never end up using past a month--is that commercial planners are SO CUTE! I'm nowhere near the first to admit that I love pretty things. As much as I love the way I use my Composition Book planner--I have customized it perfectly for our home--let's face it, it was pretty boring to look at. I bought some batting and cute fabric so that I could cover it, but then decided that I could find much better uses for my pretty fabric. So then it happened. 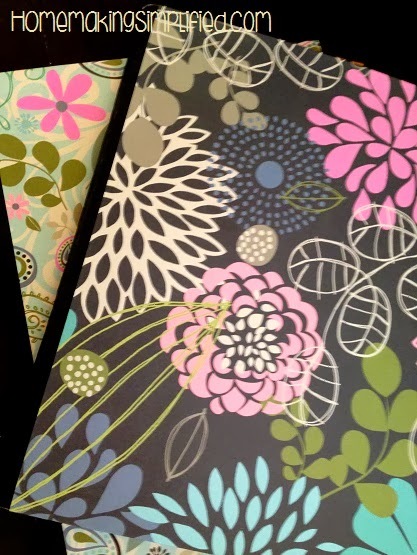 I was looking for some clothes at Ross and saw some really, really cute scrapbook paper packs for under $5. I found my cheap solution! I covered the outside of my books by cutting the paper a little bit and then folding in the excess paper while gluing it down with a permanent tape runner. Then I cut a coordinating print to be just a little smaller than the cover of the book and taped it inside to secure the cover and also to add extra cuteness! I like this method of covering because it prevents lifting from the corners, especially if you carry your book around in your car and purse as I do. Here is the inside of another book I covered. Aren't these so much cuter? I'm so excited about using them!